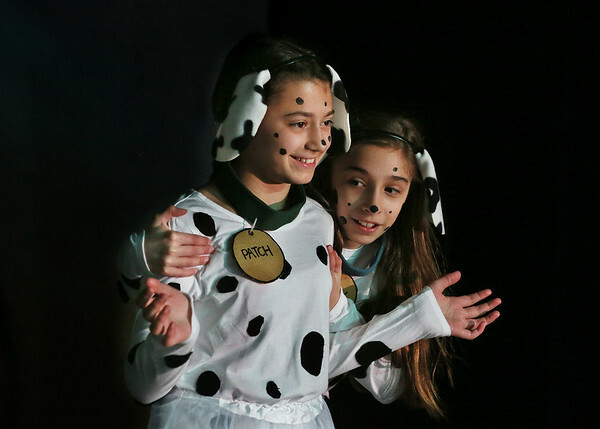 Tasara Frontiero, left, and Ally LoPiccolo play Patch and Lucky, a pair of dalmation puppies, in the fifth-grade musical "101 Dalmations" at West Parish Elementary School in Gloucester. The play, which is being staged by the entire fifth-grade class in either acting or technical roles, is directed by Heidi Dallin. Musical direction is by Helen Greene. The play will be presented to the public on Tuesday, Wednesday and Thursday, Feb. 27 through March 1, at 7 p.m. Admission is free, with a suggested donation of $5.